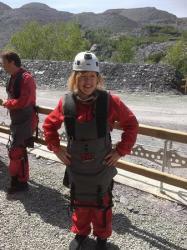 Karen, our regional development manager, and her team of daredevils took on the Velocity Zip Slide in Snowdonia to raise funds for us. It all started about a year ago after I bought my husband a voucher for the Velocity Zip Slide in Snowdonia for his birthday. For those who don’t know, Zip World Velocity 2 at Zip World Penrhyn Quarry, Bethesda, is the fastest zip line in the world and the longest in Europe. The dog and I watched him hurtle through the air suspended by what I can only describe as a giant fishhook! He was still grinning five hours later. It was then that I decided I was going to do it too – but I would do it to raise funds for Lymphoma Action. As one of Lymphoma Action’s regional development managers, I am often out and about in the North of England meeting with and speaking to clinical nurse specialists (CNSs), support group coordinators and attendees, as well as corresponding with users of our North West Facebook support group. I told everyone I could about my upcoming escapade. Many kindly sponsored me but I also managed to recruit a brave bunch of daredevils to join me. Our team comprised me, three people with lymphoma, one ‘carer’ and three volunteers including my husband and two CNSs. We set the date - 19 May. Yes, the day of the Royal Wedding and the FA Cup Final! I’m a nervous flyer and scared of heights - to say I was terrified was the understatement of the year! My husband’s attempts to reassure me were unsuccessful. I tried to remain calm for the team, but then I received an email from Velocity advising that recent improvements to the zip slide meant our descent would be even faster! The big day soon arrived and while Meghan and Harry gazed into each other’s eyes and shared their matrimonial vows, our merry band of madcaps prepared to descend across a mile long zip slide at speeds reaching almost 120mph. Our first plunge was the trial zip wire, affectionately known as the ‘little top’. Fully decked out in our flying suits, headgear, and harnesses, I climbed atop my ‘flying bed’ and the staff attached my fishhook. The bed moved out from underneath me, leaving me suspended and ready to go. I managed a thumbs up to the other zippers zipping at the same time as me, and off I went! Apparently, the ‘little top’ is to prepare you for the ‘big top’. Having made it through, we were driven 15 minutes up a mountain to the ‘big top’. Ready and waiting at our starting point, the view was stunning. It was such a glorious day with Anglesey and Puffin Island clear to see. We assembled four at a time, face down on our beds while we were checked and cross checked for safety. I was at a loss for words – anyone who knows me, knows that is unheard of! Checks completed and 3-2-1 we were off! 0 to 60 in under 10 seconds. I was flying! I was flying over a beautiful lake and a stunning landscape. It was one of the most exhilarating experiences of my life and not at all scary. I loved it! Feet back on the ground, I saw the look on everyone’s face, listened to the animated chatter and knew that everyone had enjoyed it as much as I did. As a team, we have raised nearly £5,000! I am so proud of us all. We challenged ourselves, faced our fears and did it! Thank you to everyone who sponsored us. Your generosity helps Lymphoma Action carry out vital work in supporting people affected by lymphoma.